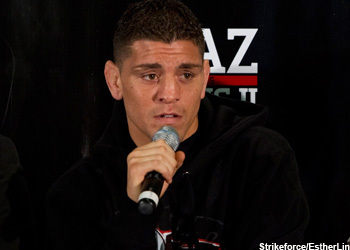 It didn’t take long for “Strikeforce: Diaz vs. Daley” to find a home. Less than 12 hours after swapping out the second leg of their Heavyweight Grand Prix for a pair of championship scraps, company CEO Scott Coker announced their April 9th event will be jumping off inside the Valley View Casino Center in San Diego, California. The San Jose, California-based promoted opted to postpone their Heavyweight GP due to the success of “Strikeforce: Fedor vs. Silva.” The tournament will now resume on June 18th inside the spacious American Airlines Center in Dallas, Texas. “Strikeforce is coming off a record presale and impressive attendance for the kickoff of the Grand Prix at IZOD Center in New Jersey that also drew a record viewership on Showtime for live MMA,” Coker added. “To build on the tremendous momentum from New Jersey we needed the proper time to promote an event of this magnitude, which is why we have decided to continue the Tournament on June 18 at American Airlines Center in Dallas, a venue that has been identified as one of the premier sports and entertainment venues in the U.S.